Hugh Wikinson : Hawaii, 1883. Japan, the Sandwich Islands, and California. 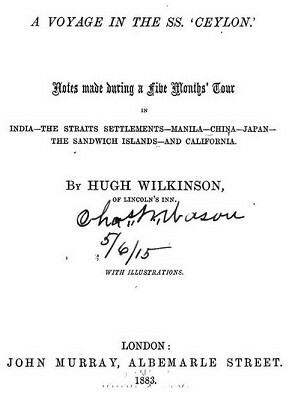 Hugh Wilkinson (1850-) notes that he does not observe surf-riding, and is severely disappointed with his visit to the Hawai'ian islands and he expresses strong critcism of many travel writers' glowing and misleading descriptions, such as Mark Twain and, in particular, Isabella L. Bird. Extracts from Six Months in the Sandwich Isles, John Murray, London, 1875. 10 hr. 32 min. behind our home time. Disappointment and disgust are weak words with which to express our feelings after having first heard of and then having seen this overrated and priest-ridden spot. After fifteen days at sea, one can easily understand that almost any land would be welcomed with delight, and any beauties that it might possess would be magnified — perhaps a little pardonably. But not-withstanding this, the cruel blow has been felt keenly by all on board. the same mind, and amongst the masses of ordinarily cultivated tourists it is equally impossible there could be any substantial diversity of opinion. I am not prepared to say that if one had read nothing of these islands one would have been so much disappointed ; but it seems that the further away the land is, the greater is the rubbish written about it, for there is the less fear of exposure. On board we hear none but very uncomplimentary remarks on what the most generally-read book-writers have said of Honolulu, but especially of Miss Bird and her poetically-written but misleading book. To Miss Bird it may be a 'bright blossom in a summer sea,' or 'a dream world, pure and lovely, where balmy zephyrs stir the dreamy blue.' It may be all that has been written of it by the other writers, to them. It may be the most beautiful spot they have seen on earth — if so, one can understand their effusion. Moreover, these sentimentalists are almost invariably wanting in the faculties of both comparison and memory. If these people have not seen anything really grand — if they have not seen the glories of the tropics near the Equator, nor the majestic splendours of the ' last of earth ' — the Himalayas — they dream over anything, from a pretty woodland scene down to a lily or an old pot, swamping all in a flood of ' high-falutin ' effusion : if they have seen these supremest glories of earth, they very conveniently forget them — at the moment. If big words are used for little things, what is there left for the mighty ones which are worthy of them ? Over and above this, in the case of the ' sentimental lady authoress,'Tis always the last suitor that wins the woman's hand '; so they are always more or less in a state of gush, without much caring what it is that calls it forth. This is the only explanation that is to be given of what has caused the greatest pain and disappointment to, I think, everyone on board throughout our tour. As an instance of the powerful physique of the women, a story is told of a man and woman, who, being washed out of their canoe, attempted to reach the shore by swimming. A strong current, however, carried them out to sea, and they were obliged to strike out for an island some forty-two miles distant. About halfway to it, the brave woman, finding her companion incapable of swimming farther, owing to a severe wound in his head, supported him for the rest of the way, and eventually brought him safely to shore. Her heroism, however, was unrewarded, for on arrival the poor man was found to be dead. Hilo, and our kind friends there." With the exception of the sight of the volcano, and the ride through the forest, everyone has been sadly disappointed with these islands. 'The enchanted regions of eternal summer and perpetual calm;' 'these pearls of the Pacific,' surrounded by their 'oily, breezeless seas;' 'this dream-world, pure and lovely,' which all have looked forward to with so much pleasure, is stll unrealized ! It still belongs to the realms of dreams. the air laden with the scent of flowers, the rich sunlight and fruits in sickly profusion — where are they all ? Echo answers, ' Nowhere !
' Yet all these will still belong to the Sandwich Islands of our fancy, but not to the Sandwich Islands of our realization. of course is far more beautiful than the miserable reality. Geoff Cater (2013) : Hugh Wilkinson : Hawaii, 1883.